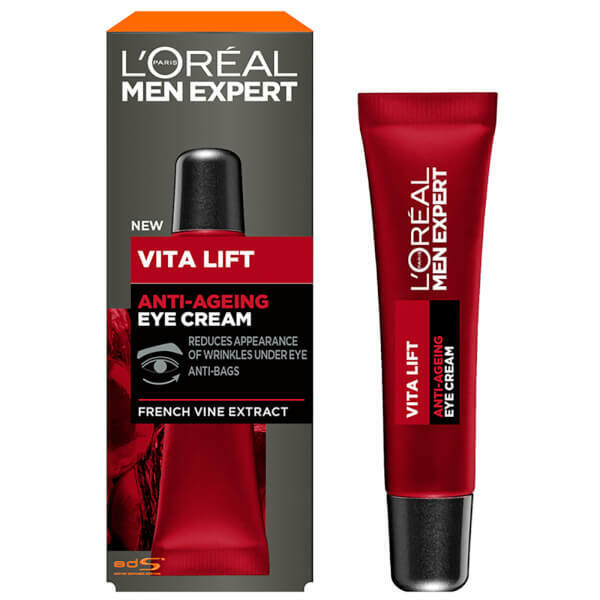 Transform the look of tired, ageing eyes with L’Oréal Paris Men Expert Vitalift Anti-Wrinkle Eye Cream. Specially formulated for men, the anti-ageing eye cream targets signs of ageing around the delicate eye area to promote a smoother, firmer-looking eye contour. Enriched with antioxidant French Vine extract and Peppermint, the eye treatment helps to reduce the appearance of wrinkles, fine lines and bags while reinforcing skin's natural defences against external aggressors (environmental factors known to accelerate signs of ageing). Non-greasy, non-sticky and fast absorbing, the smoothing eye cream will leave eyes looking brighter and more youthful. Apply daily in the morning and evening. Apply under eye area and smooth gently with the applicator. 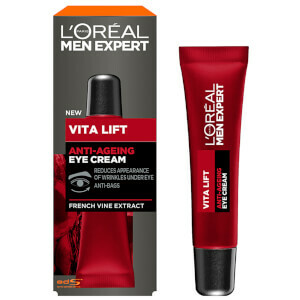 Use after the Vita Lift Moisturiser for best results. Aqua / Water, Alcohol Denat., Glycerin, Propanediol, Propylene Glycol, Vitis Vinifera Seed Extract / Grape Seed Extract, Mentha Piperita Extract / Peppermint Extract, Carbomer, Ruscus Aculeatus Root Extract, Caffeine, Methylsilanol/Silicate Crosspolymer, Escin, Sodium Dextran Sulfate, Sodium Hyaluronate, Sodium Hydroxide, Serine, Perlite, Adenosine, Cryptomeria Japonica Bud Extract, Hydroxypropyl Tetrahydropyrantriol, Tetrasodium EDTA, Xanthan Gum, Pentylene Glycol, Butylene Glycol, Tocopherol, Phenoxyethanol, (F.I.L. B210904/1).